The park is made up of five paths with different difficulty levels (Civenna has 5, Margno has 4). 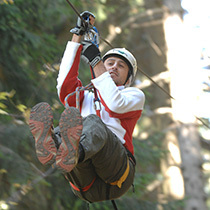 The difficulty is based on the height of the trees and by the type of obstacles that connect one tree to the next. After being equipped with harness and helmet, under our staff supervision, you will be brought to the Briefing area, where you will be given a demo and where you can get comfortable with our four demo walkways. Now you’re ready for some adventure! You will then perform the walkways on your own, supervised by our instructors from underneath. Based on little plastic balls, the soft air is completely harmless and definitely environment friendly. Directly inspired by the MILES system used in army training, this is a way to play WARGAMES. 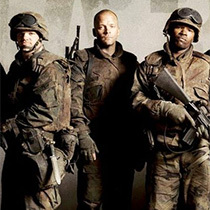 Soft air is the game version of the combat simulation systems used by different armies. Just like in real military action you engage your opponent at considerable distance. Experience the shooting, test your aiming ability, change your movement tactics, but be careful because a sniper on the hill might hit you! Challenge your friends by creating teams that will contend for a flag or for a territory. Anyone can approach this wonderful experience and play wargames with the soft air system. In additional to the professional instructors it will be provided all the equipment: helmets, camouflage goggles and rifle. NEW 2016 DYNAMIC RANGE SHOOTING IN WEEK END. Price : € 5 . Bookings on site. Here the opening in August: Sunday 7, 14 , 21 from 13.30. Experience the excitement of archery! In the beautiful natural environment of the Jungle Raider Park, you can try the modern version of one of the oldest activities in the world, challenging yourself and your friends in an authentic 3 stations polygon, with enjoyment, satisfaction and skill! 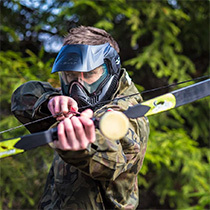 Archers of TAS, a company specializing in the archery, will provide the protections necessary individual and identify the arch is best for you, guaranteeing high-quality equipment. 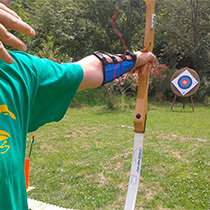 Then, after a briefing demonstration, they will accompany you in your first pitches guiding you with personalized recommendations for improving technique and efficiency and become familiar with a bow and arrow. At this point you are ready to test you over longer distances! Even boys and girls ages 8 and up can feel smart “Robin Hood” and bold “Rebel”! Under this age it is advisable to request a free trial at the Polygon. Opening in August: open every day from Monday to Friday from 14 to 18. Saturday and Sunday from 10 to 19. Tuesday closed. 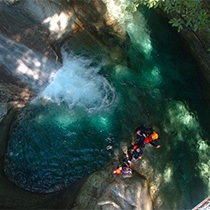 This activity takes place in the summer in the torrents of Acquaduro (Introbio, Valsassina) or Bodengo (Valchiavenna). The whole activity lasts half a day (morning or afternoon). 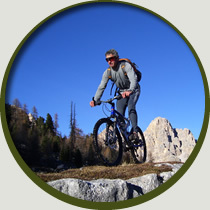 Each guide can manage groups of minimum 5 to maximum 10 people. Based on available material and space, we can handle maximum 2 groups (with two guides) for a total of 20 people. Groups will go in turns. You will be equipped with: double neoprene wetsuit, neoprene boots, helmet, harness, carabiners, ropes and descender. You must wear a bathing suit and hiking boots.